The Oceania International Championships are happening this weekend in Melbourne, Australia as the first major International event for VGC 2019’s Moon Series. This will be the sole International Championship taking place in Moon Series, so players looking to make a statement at this point in the season must do it in Melbourne. In regards to how the metagame will show itself this weekend, players seem to know which restricted Pokemon they’re going to have to prepare for. Xerneas, Kyogre, Lunala, Groudon and Yveltal are going to be all over Melbourne, but what about their non-restricted supporting cast. Sure, we could talk all day about format staples like Incineroar, Kartana and Amoonguss, but there have been some hidden gems making themselves known in the current metagame. Let’s take a look at some of these Pokemon that are certain to make a splash this weekend at the Oceania International Championships. Tsareena has been around since the beginning of the 2019 season, but after being snubbed on a few teams for Pokemon like Kartana and Tapu Lele, it seemed like players almost completely forgot about how good Tsareena can be. Tsareena’s main shtick is its signature ability, Queenly Majesty, which blocks priority moves from the opponent’s Pokemon. This makes it an excellent partner for a Choice Scarf Kyogre which is pretty much guaranteed a fast Water Spout without the threat of any priority attacks lowering its HP. But that’s not the only thing Tsareena is good at. Tsareena is amazing at pressuring the opponent with moves like Feint to break opposing Protects and Helping Hand to increase the damage of its partner’s attacks. With tools like these, Tsareena is a fantastic partner to a number of the powerful restricted Pokemon other than Kyogre. We saw this first-hand as Nick Navarre excellently utilized Tsareena next to his restricted combo of Groudon and Xerneas. And Tsareena’s highs don’t stop there. Tsareena also excels offensively with powerful attacks like Power Whip and High Jump Kick being a great offensive combo for it. If a Tsareena is built more supportive/defensively however, U-Turn is a great way for Tsareena to pivot out of battle while also getting some nice chip damage. Tsareena is an amazing support Pokemon that doesn’t allow your opponent to get the jump on you with priority moves or play defensively with Protect. This Pokemon will surely be a popular pick for the remainder of VGC 2019. 2019 is Talonflame’s comeback year, and we’ve already given you a laundry list why that is the case. To briefly summarize, Talonflame is still fast, strong, and a great offensive utility for many teams in the metagame. Forget what you’ve heard about Gale Wings being a bad ability, because that simply isn’t the case. Gale Wings either gives Talonflame a free Tailwind or a free hit with either a normal Brave Bird or a Supersonic Skystrike with the Flynium Z equipped. Normally, Talonflame flocks to Groudon and Xerneas teams which is reminiscent of the “Big 6” days of VGC 2016. Let’s call Talonflame the Tornadus for Sun teams. Think about it. It’s a Tailwind setter, has a fast Taunt, and even has an attack that benefits from the weather conditions. It misses out on Prankster, but Gale Wings gives Talonflame a Prankster-esque effect for offense and defense at least once. The two play similar roles on their respective team archetypes, and I would expect to see these two battling it out for dominance this weekend. Gengar has emerged as one of the many amazing benefactors of Z Crystals entering the VGC 2019 metagame. Losing Levitate and now its ability to Mega Evolve (for now) seemed like bad news for Gengar, but experienced players this season have shown us just how good Gengar can be despite these heavy shortcomings. Gengar fits also in the role of offensive support, but with a Z Crystal, things are weighted more towards offense. The go-to Z Crystal for many players is the Ghostium Z which serves two main purposes. First, is the powerful NeverEnding Nightmare attack which is guaranteed to wipe out an opposing Lunala. The second use is Z Destiny Bond which re-directs attacks towards Gengar, increasing the chance that Gengar gets KO’d and takes its attacker with it. Gengar is already a very fast Pokemon, so it’s usually able to threaten Z Destiny Bond in most situations. To round out Gengar’s usual bag of tricks, Sludge Bomb is an amazing attack to take on the many Grass and Fairy-types in the metagame while Taunt can shut down opposing Xerneas, Trick Room or other support options from the opponent. This is a Pokemon that is capable of doing a ton of work in a favorable matchup. This reigning king of VGC usually doesn’t get a lot of attention in formats that allow restricted Pokemon (you can likely thank Groudon’s existence for that) But, 2019 seems to have given Landorus a path back into the limelight doing what it does best. Maybe with a bit more firepower. Like the aforementioned Gengar, Landorus greatly appreciated Z Moves coming back into the metagame. Groundium Z Landorus was a popular choice in the later half of VGC 2018 after players realized that Landorus had more potential outside of its typical Choice Scarf and Assault Vest variants. Landorus’ Tectonic Rage packs one heck of a punch coming off of Landorus’ impressive base 145 attack stat. Combine that with a boost or two from Swords Dance, and this is a Pokemon nothing without Levitate or wings will want to switch into. Even if an opponent is immune to Ground-type damage, Landorus can still fall back on its trusty Rock Slide for coverage. Even with this more offensive identity, Landorus still does what it does best and can easily cycle Intimidate in order to weaken some of the big physical threats in the metagame. Landorus’ return has been a bit of a nightmare for Groudon, especially when some players like to pack Safety Goggles on their Landorus to specifically tech against the Groudon and Venusaur matchup. 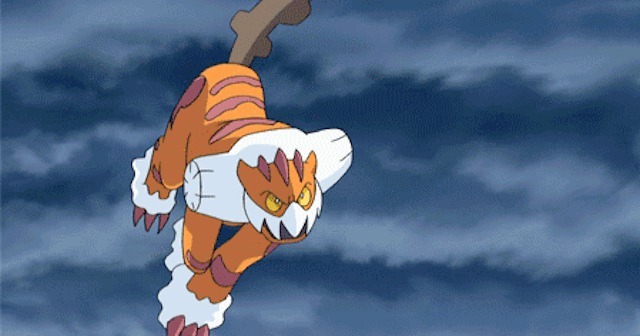 Landorus is back in the VGC metagame, and its looking to reclaim its spot as the best Ground-type and Intimidator in VGC.